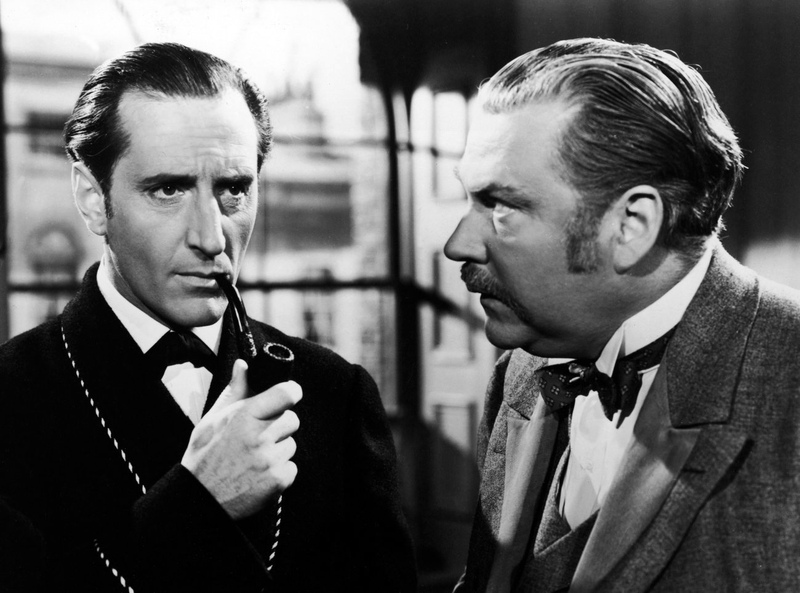 Of the many film series of the 1930s and 1940s, Sherlock Holmes stood out both for its watchability and its unusual provenance. It was launched at 20th Century Fox in 1939 as a high-end period production. But after two very strong films, The Hound of the Baskervilles and The Adventures of Sherlock Holmes, Fox unaccountably dropped the series. Enter Universal Studios, who retained the lead actors and moved the series to modern times (Partly for WWII morale building and partly as a cost-cutting measure). Fox made a dozen modestly budgeted Holmes films in rapid succession over the next four years. Financial constraints and breakneck speed of production were no barrier to quality in this case. None of the films are bad and several are outstanding, including this week’s film recommendation: 1944’s The Scarlet Claw. The plot: Holmes and Watson are in Canada, participating in a conference about the occult in which Holmes’ open scepticism about the supernatural irritates the organizer, Lord Penrose (Paul Cavanagh, a handsome, solid B-movie actor who appeared in several films in the series and also in one of my previous recommendations, The Kennel Murder Case). Penrose gets a message that his wife has been murdered, and the meeting is abruptly adjourned. Holmes presently receives a telegram sent by Penrose’s wife just before her death, saying that she feels she is in grave danger and wants Holmes to help her. Despite Lord Penrose’s hostility to him, Holmes sets off for the fog shrouded town of La Mort Rouge, where the locals believe a monster is ripping the throats out of livestock and also people. The monster is targeting particular individuals for some mysterious reason…can Holmes discover the motive behind the grisly crimes and save the next intended victim? The heart of the Universal series are the triumvirate of Producer-Director (and in the case of The Scarlet Claw, co-screenwriter) Roy William Neill and stars Basil Rathbone and Nigel Bruce. With his mien, delivery and intelligence, Rathbone was born to play the king of detectives and he defined the role for a generation through appearances on radio, television, film and stage. 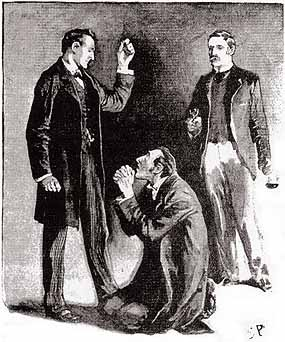 Neill and Bruce decided to make Watson much more comic than he was Doyle’s stories, which irritated some Baker Street Irregulars. If you can let that go and just take the performance for what it is, you will appreciate that Bruce is indeed agreeably funny in the role and also contributes some moments of emotional warmth which balance out his calculating machine of a friend. The Scarlet Claw is a high point of the series in part because it feels like an old-fashioned Victorian Holmes story even though it is set in the present day. Unlike in prior entries, Holmes is not battling Nazis but a killer who is (as in many of the films) a pastiche from the original stories. The moody, dark surroundings in rural Canada could easily pass for the Baskerville estate in Dartmoor. Also on display are some first rate make-up and special effects work, which is essential to the story for reasons I will not reveal. The film is also the career highlight of little-known British character actor Gerald Hamer, who makes the most of the opportunity to demonstrate his versatility as a performer. The script is strong and Neill by this point in the series had mastered every aspect of how to create fine Holmesian cinema. The result is a skillfully made, suspenseful mystery. More generally, as a body of work, the Universal Sherlock Holmes films depart too significantly from the original stories for some people’s tastes, but in performances and atmosphere they stand shoulder to shoulder with the tremendous Soviet Livanov-Solomin and British Granada television versions as high-quality, sustained efforts to adapt Conan Doyle’s beloved stories to the screen. Also, the prints of these films have been beautifully restored by the angels at the UCLA film preservation archive. Scarlet Claw is my favorite, but you could pick up almost any of the Universal series and have a fine evening watching the world’s greatest detective work his magic. their favorite time of year! Mine too, not least because there are so many enjoyable Christmas films to recommend, starting with an episode from Granada Television’s justly revered Sherlock Holmes series: The Blue Carbuncle. Eccentric, unstable, dashing Jeremy Brett, whose acting (as Edward Hardwicke put it) contained “a whiff of the Edwardian” was an inspired choice to play Holmes in this handsomely produced series. 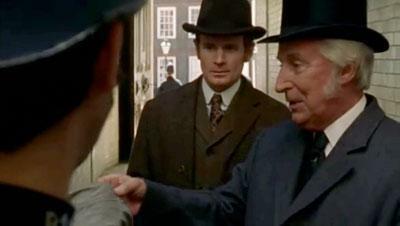 David Burke makes a fine, gentle Dr. Watson in the early episodes, succeeded by an equally good Edward Hardwicke as a flintier sort of Watson in the latter part of the series. 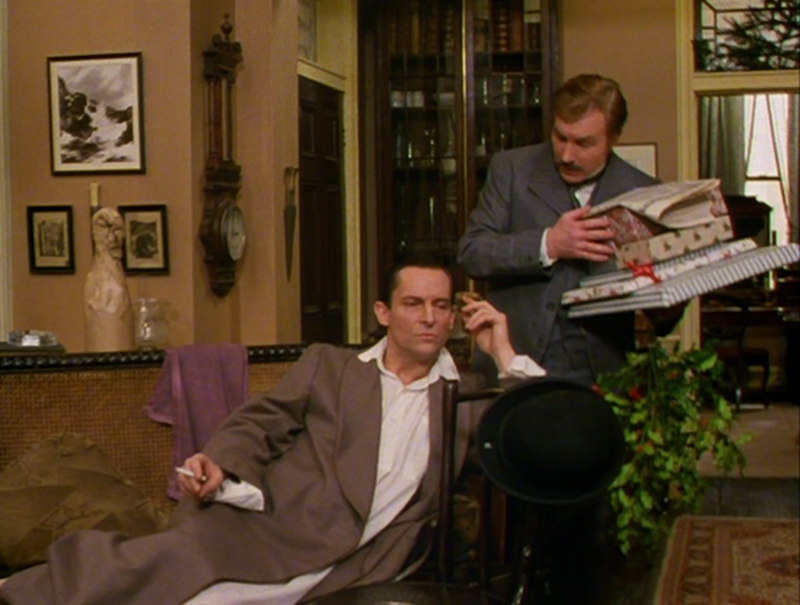 The Blue Carbuncle features Burke as Watson, and the byplay between the actors is a marvel, bringing out the warmth of their friendship yet also Holmes’ tendency to talk down to Watson, sometimes with marked asperity. The plot: It’s Christmas time in London, though the scowling Countess of Morcar is unhappy (Rosalind Knight, putting just the right undercurrent of humour into an overtly Scroogish performance). She finds Christmas a chore in any event, but even moreso when her precious gem, the blue carbuncle, is stolen! Meanwhile, Commissionaire Peterson (Frank Mills) brings a goose to Holmes with a strange story of how he has seen a man lose his treasured Christmas dinner. Through an ingenious series of deductions, Holmes sees that the two mysteries may be connected, but he must race against time as an innocent man (Desmond McNamara) has been framed for the crime, leaving his struggling wife and children in agony as the holiday approaches. As with the series as a whole, the original material is treated reverently, with many lines lifted straight from the text and the climactic scene nicely staged to match Sidney Paget’s drawing from the original Strand magazine publication of Doyle’s story. And the Christmas spirit is everywhere, in the incidental Victorian-style music, set decor and story elements. Not generally thought of as a Christmas movie, The Blue Carbuncle is a fine appetizer for your family by the fire, before you tuck into your own Yuletide bird. p.s. Interested in a different sort of film? Check out this list of RBC recommendations. The White Knight Stratagem was the final episode of a handsomely produced 2000-2001 British television series that re-imagined the Sherlock Holmes stories. The protagonist of the “Murder Rooms: The Dark Beginnings of Sherlock Holmes” series was Arthur Conan Doyle (center of photo at right) who learns the methods of Professor Joseph Bell (far right of photo) as they solve monstrous crimes. Baker Street Irregulars will enjoy how many of the cases contain elements that ultimately appear in the Holmes canon. The White Knight Stratagem is to my mind the best of the series, which is truly saying something.